Receba conteúdo curado sobre automação de energia assinando a nossa newsletter! Open source is becoming the default business model for software. We believe open source systems provide efficient solutions for business problems and this will also be the future of SCADA, automation and IoT/IIoT systems. ● Development and customization of open source communication protocol stacks (DNP3, Modbus, IEC60870-5-104, ICCP, MQTT, ...). ● Creation of an open source SCADA/HMI system (OSHMI). ● Applying open source databases for historical data recording and corporate systems integration (PostgreSQL/Timescale, InfluxDB, MySQL, SQLite, MongoDB, ...). ● Development and use of open source real-time web-based visualization systems (SCADAvis.io, xPlain, Grafana, Vega, ...). ● Configuration of backend systems (Apache, Nginx, PHP, Node.js, ...). ● Deploying secure cloud systems on AWS and Azure. ● Integrating SCADA with advanced yet affordable BI tools like MS PowerBI and Tableau. ● We have also knowledge of Big Data, Data Science and Machine Learning Systems. This is why we can create custom integrated solutions that are affordable, powerful and future proof as they can evolve together with the underlying open source software. Avoid vendor lock-in and save (much) money! HTML5 Toolkit for the creation of real-time animated synoptic graphics. Embed stunning synoptic graphics into your web apps, animate with your real time data with absolute privacy. Plans starting at free! The graphic power of a real SCADA (OSHMI and xPlain) available to any web app. Pure HTML5 visualization, framework agnostic and available on any platform: desktop or mobile. Visit the SCADAvis.io website and start developing graphics now! Cloud platform for SCADA/IoT real-time data visualization and control. ● Connects safely SCADA/IoT devices to the cloud. ● SCADA/HMI data displays, events, historian, data processing and integrations. ● Easily customizable interactive dashboards. 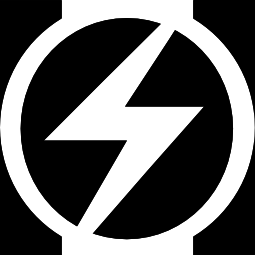 ● Safe sharing of dashboards and displays. ● Pure HTML5 visualization, available on desktop/mobile platforms. ● Eliminates bare metal server, storage, physical space and management costs. We welcome partnerships with control and monitoring devices manufacturers and systems integrators. Visit the website to access the live demo. ● A wide range of certified protocols. ● Excellent embedded tools for protocol monitoring and troubleshooting. ● Easy of configuration and maintenance. ● IEC61131 (ISaGRAF) Logic programming . ● Freedom of choice of hardware. ● Affordable licensing, with unlimited tags and protocols. Get your fully functional demo of Enilit CMS (requires a restart after 12h)! 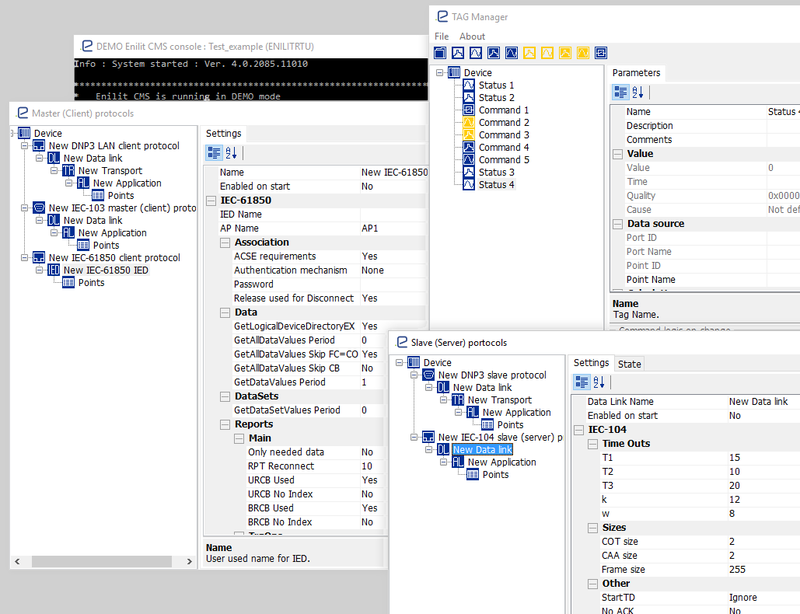 Excellent tool for protocol debugging, HMI and IED testing! 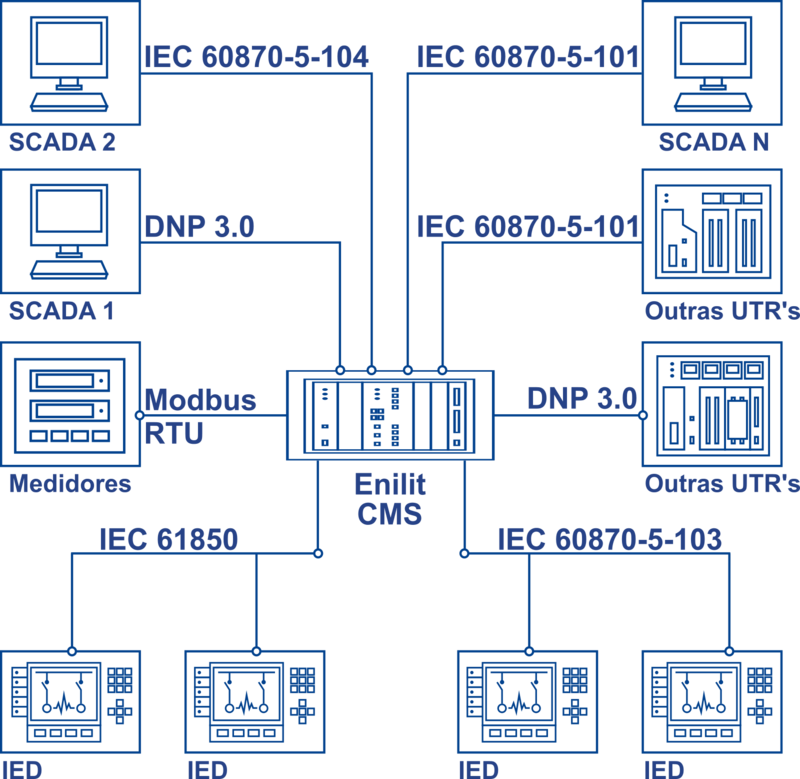 IEC61850, IEC60870-5-101/103/104, DNP3, Modbus, etc. If you are out of Brazil, please contact Enilit directly. Click here to access OSHMI online demo. 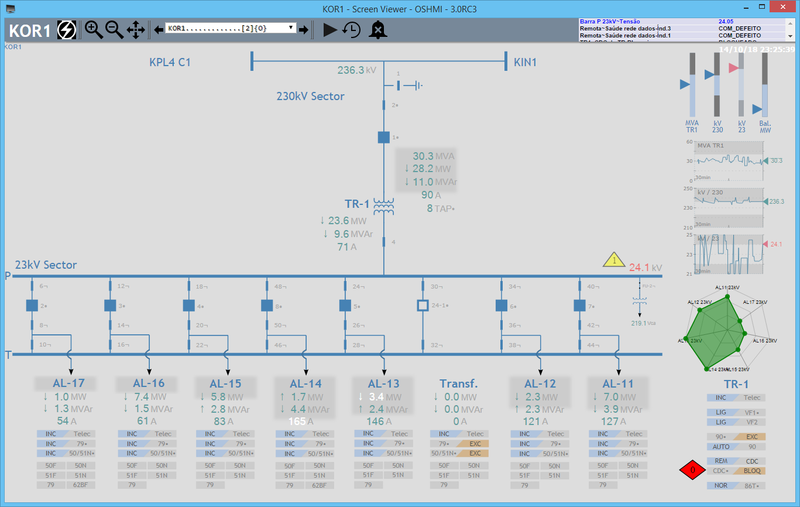 OSHMI is an HMI software designed for substation control and generic SCADA applications, distributed as open source (GPL), with no licensing costs. It is based on HTML5/SVG resolution independent visualization technology that is mobile and cloud friendly. This solution is used to control locally and remotely dozens of substations up to 230kV voltage level and in control centers for over a decade. OSHMI makes it possible to apply the High Performance HMI methodology that is now standardized as ANSI/ISA101 (Human Machine Interfaces for Process Automation Systems). A study* by the ASM Consortium (Abnormal Situation Management), concludes that the operation of a high performance interface allowed to detect problems before alarms in 38% more cases, finished assigned tasks 41% faster, and attained 25% more on successful resolution of problems in relation to a traditional interface. DSC Systems offers expertise, customization, training and support for this platform. 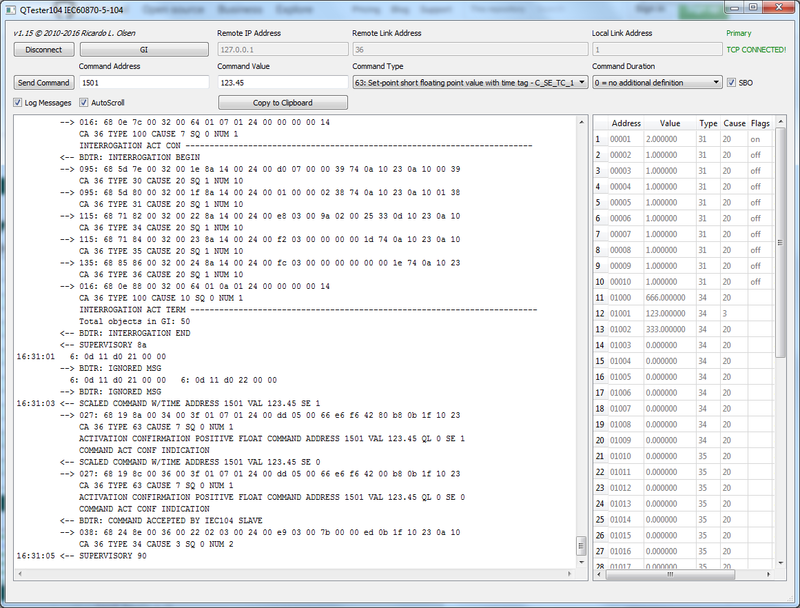 Free open source tool to test the IEC 60870-5-104 protocol. Works as a master scanning and commanding slave devices. We have experience with SCADA/EMS systems, substations and control centers since 1998. We develop SCADA, historians and corporate systems integrations since 2001. Our mission is to provide services and apply technologies that can provide better results to our clients in their operations. DSC Systems adopts an HTML5 visualization platform that has been developed and perfected since 2008.